There is an old saying: �Flowers have their rules for blossoming and withering�. In the Tropical Botanical Garden of Xishuangbanna, you can see a small and yellowish flower everywhere, whose name is sweet turnera. During its florescence, when the sun rises every morning at about 9 a.m., the flowers will throw open; and when the sun sets in the afternoon at about 6 p.m., the flowers will close up. They do the same everyday, and such scene lasts about one week before they languish. These beautiful and yellowish flowers originate in the remote South America. 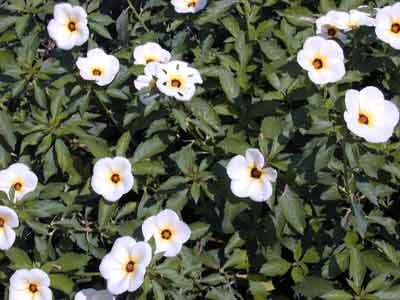 Sweet turnera has many varieties; the ones we often see are yellow sweet turnera and white sweet turnera. Why do sweet turnera flowers throw open punctually? This is because they have biological clocks, which is formed in long-term evolvement for the sake of fitting the changes of the environment. It is also a kind of genetic property controlled by gene. As a matter of fact, plants, animals and human beings all have biological clocks. As long as he looked at what flower was blooming on the �clock of flowers�, he could know what time it was approximately.